Virginia Uranium has sponsored four trips to uranium mines and mills in France and Canada. These trips have enabled Virginia Uranium’s management team, state legislators, and local community members to learn more about how uranium mining has affected the communities and environments in which it has taken place. The trips have also helped Virginia Uranium to identify the best practices in the industry so that the company may build the safest operation possible. 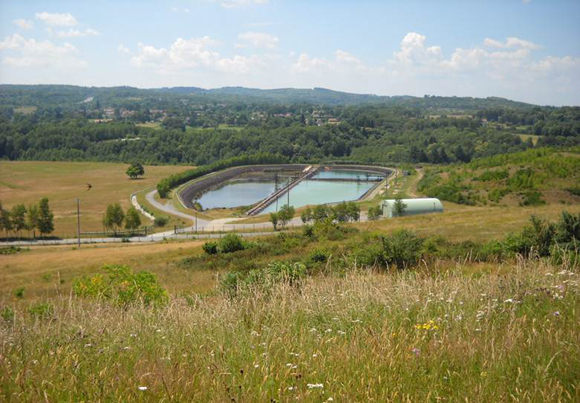 Two trips to Bessines, France, enabled Virginia Uranium and state legislators to learn more about France’s uranium-mining history and practices. Travelers saw a former mine and mill site and visited tailings facilities; they also met with the mayor of Bessines. 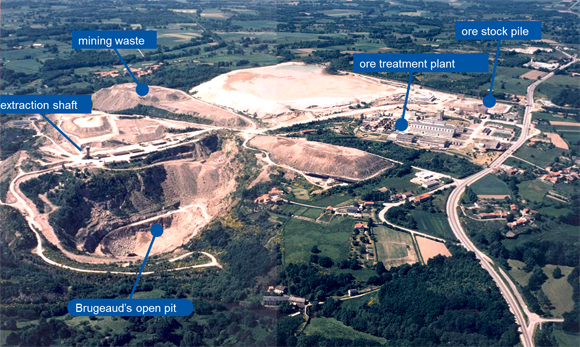 Areva operated an open-pit mine in Bessines from 1948 until 1995, and mining research facilities currently oversee the tailings management facilities in Bessines, in addition to examining various advances in mining and milling. Click here to visit Areva’s web page on Bessines. Virginia Uranium takes special note of French uranium mines, because sites like Bessines bear important similarities to Pittsylvania County, where Virginia Uranium proposes to mine the Coles Hill deposit. For example, the Limousin region of France, in which Bessines is located, has humidity levels, precipitation, and temperature ranges almost identical to those of Pittsylvania County. Limousin also shares striking similarities with Pittsylvania County in terms of agricultural production, especially dairy and beef cattle production. Moreover, Limousin boasts a much higher population density than Pittsylvania County. 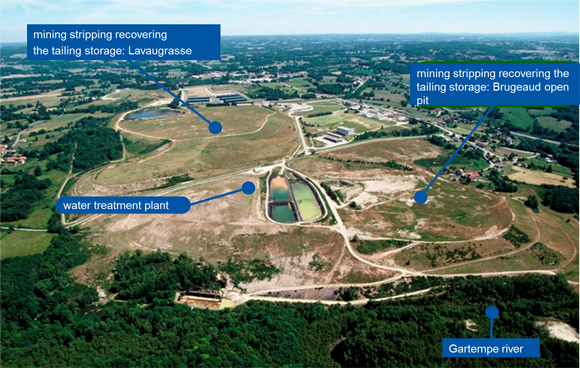 View pictures of an operational tailings facility and the former mine at Bessines below. 1) Bessines mine in 1978 during operation. 2) Bessines 23 years later, after closure of mine. It is standard practice to build water-treatment plants, like the one in the picture below, at modern uranium mines. The tenth-century village of Bessines is visible in the background, as well. 3) Bessines in 2009, fourteen years after mine closure. 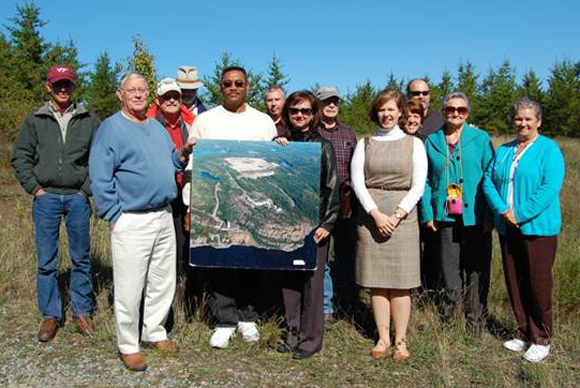 Nine citizens of Pittsylvania County visited Elliot Lake, Canada, the former “Uranium Capital of the World,” on a trip sponsored by Virginia Uranium. From the 1950s to the 1990s, several mines owned by Rio Algom and Denison Mines produced a lion’s share of the world’s supply in Elliot Lake. Travelers saw former mine and mill sites and visited tailings facilities. They also met with representatives from the Chamber of Commerce, business leaders, and local government representatives from Elliot Lake—with people who had lived and worked beside uranium-mining operations for decades. Elliot Lake still prospers by making use of its natural resources, but the city is no longer home to any uranium mines. Now, her pristine lakes and forests rich with wildlife draw hundreds of tourists, fishers, hunters, and active retirees each year, feeding the city’s tourism- and retirement-living-based economy. Elliot Lake is an excellent place to see how much the uranium-mining industry has changed over the past several decades and how mining and milling have affected the city’s community and environment. 1) Group at former mining/milling site. Active operation pictured in poster. 2) Tailings management facility. While there are many tailings dams in Elliot Lake, the “prime option” for tailings disposal designated by the Nuclear Regulatory Commission, the federal agency overseeing milling operations and tailings disposal in the U.S., is below-grade disposal—that is, disposal in specially excavated pits or former mines. 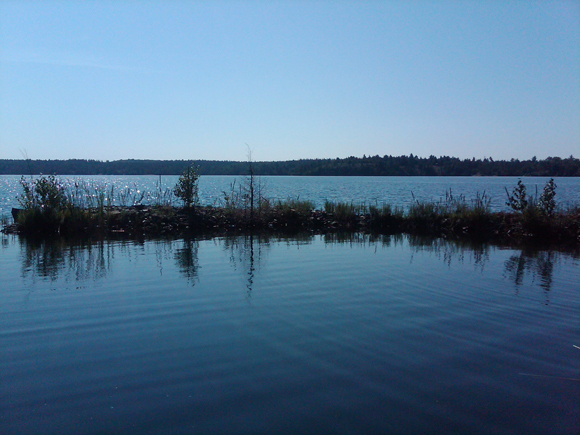 3) View of Quirke Lake, a lake currently used for recreational purposes such as water-skiing and fishing. Quirke Lake is located just beside and downstream from a tailings management facility. 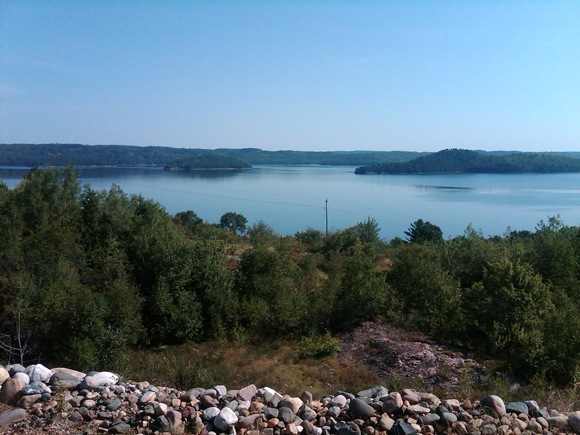 4) View of Elliot Lake. Virginia Uranium sponsored a trip for legislators and local community members to an active mine and mill in Saskatchewan, the Canadian province which is home to extremely high-grade uranium deposits and produces nearly 20 percent of the world’s supply. 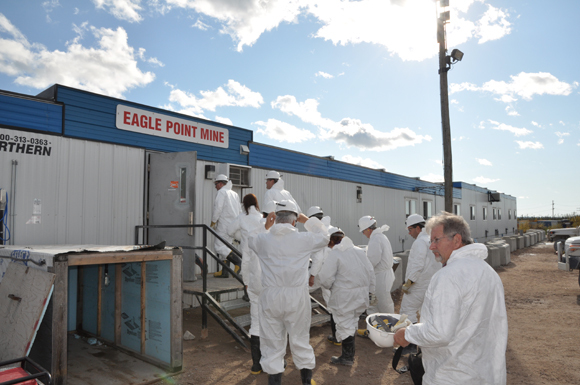 Visitors visited Cameco’s Eagle Point mine and Rabbit Lake mill. In addition, they met with several Canadian regulators. Larry Aaron, a science teacher at Chatham High School in Pittsylvania County, Virginia, wrote about his trip in three articles, links for which you may find below. 1) Group at Eagle Point Mine. Larry Aaron, Chatham High School science teacher, pictured at far right. 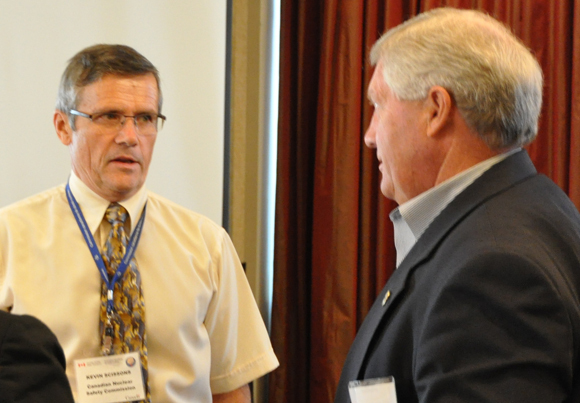 2) Ken Bowman, (right) Pittsylvania County Economic Development Director, speaking with Canadian regulator. 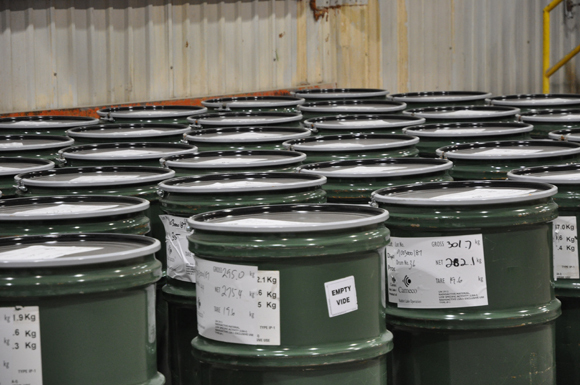 3) Drums of yellowcake, the finished uranium product, ready for shipment.